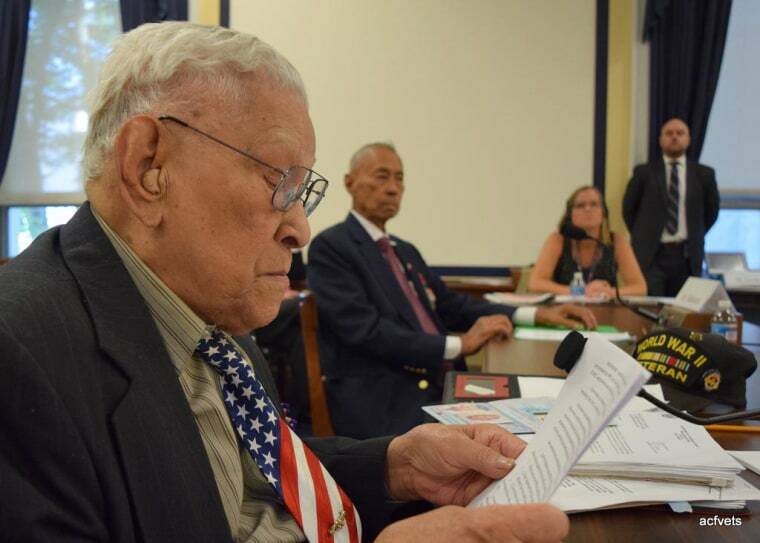 Filipino veterans of WWII like Jesse Baltazar -- a 94-year old from Virginia -- know firsthand the story of the Bataan Death March. He lived through it, was wounded in battle, and awarded a Purple Heart. But the longest battle of his life began after the war ended. Baltazar is one of the lucky 18,000 veterans still alive who has been able to successfully cut through red tape, fighting initial request denials to receive U.S. Veterans benefits. More than 4,500 others, like 97-year-old Celestino Almeda, are still fighting for their own funds. Today, some will testify before a Congressional subcommittee about their struggle. Even though Congress in 2009 approved one time payments of $15,000 to veterans who are U.S. citizens ($9,000 for veterans who remained Filipino citizens), survivors and families complain that the Department of Veterans Affairs refuses to make the verification process easy for the Filipino vets. Payments have been denied Almeda and others whose identification and evidence of service have been deemed inadequate. Among Almeda’s documents are pay stubs and his formal discharge documents from 1946. Over $50 million, out of an original $265 million fund, remains to be paid out to veterans and their surviving spouses. Eric Lachica, volunteer executive director of the American Coalition for Filipino Veterans based in Arlington, Virginia, said there may be hope with the new VA Secretary, Robert A. McDonald. Trust has always been an issue in the story of the Filipino WWII veterans. When the Philippines was a commonwealth of the U.S. in 1941, President Roosevelt ordered 100,000 members of the Philippine Army placed under U.S. Army command. Almeda was among them, and continued to serve until his discharge in 1946. But that same year, President Truman signed the Rescission Act, essentially stripping the Filipino veterans of the rights and benefits they had expected from their service. For decades, the veterans have fought for a restoral of that right. In 2009, Congress approved the Equity Compensation law directing prompt payments to the Filipino veterans. Few anticipated the verification problem. Authenticating the documents on both the Philippine and the U.S. side, said Lachica, has been a nightmare. Records were lost during the Japanese occupation of the Philippines during the war. From Lachica's experience with both Almeda's and Baltazar’s cases, he says the National Personnel Record Center -- the custodian of U.S. military records -- has neither been accurate nor complete. “They couldn’t find my name,” said Almeda. His documents were, however, sufficient to apply for and be sworn in as a U.S. citizen in 1996. Then in 2003, again based on his records, Almeda was allowed to apply for VA hospitalization after President George W. Bush signed the Health Care for Filipino Veterans law. Almeda's paperwork got him a VA universal access card for health benefits. But since the passage of the 2009 compensation law, Almeda has been denied the monetary benefits due to Army and guerrillas multiple times. Calls to the House Veterans Affairs subcommittee were not returned at this writing. Lachica said he hopes the veterans' group may get a meeting with Secretary McDonald soon. Almeda remains optimistic that his service fighting under the American flag will eventually be recognized. Still, at 97, Almeda says he can sense time is running out, and refuses to give up on what he says is owed to him.